Social class refers to the hierarchical distinctions between individuals or groups in societies or cultures. Anthropologists, historians, and sociologists identify class as universal, although what determines class will vary widely from one society to another. Even within a society, different people or groups may have very different ideas about what makes one "higher" or "lower" in the hierarchy. Different defining characteristics have developed in societies around the world and have changed through history. Depending on the definition used, class can also be associated with social status, or one's social position in a culture. Because of the vagaries of the word, the idea of social class has been the object of much study in fields such as sociology and economics. Some of the more famous theorists of class include Karl Marx and Max Weber. Despite the work of these intellectual heavyweights, the value of the notion of social class is still questioned as it becomes even more difficult to define in an increasingly fluid and globalized society. Beyond the problems in theoretical conceptualizations, the practical impact of social class on society is important. Any system that divides people and then assigns different values to the groups is inherently problematic in the establishment and maintenance of a harmonious society. If vertical divisions among people can connote no difference in value, only in role, experience, or responsibility in society, then social class may be considered a useful concept. Class can be manifested through many aspects of one's self, one's family, and one's lineage. However, in many societies morality often ensures that the old, the young, the weak, and the sick maintain a good standard of living despite low class status. Having characteristics of the majority ethnic group and engaging in marriage to produce offspring improve one's class status in many societies. But what is considered "racially superior" in one society may be exactly the opposite in another, and there have been societies, such as ancient Greece, in which intimacy with someone of the same gender would improve one's social status so long as it occurred alongside opposite-gender marriage. Also, a sexual orientation and, to a far lesser degree, minority ethnicity have often been faked, hidden, or discreetly ignored if the person in question otherwise attained the requirements of high class. Ethnicity is still often the single most overarching issue of class status in some societies. As societies expand and become more complex, economic power will often replace physical power as the defender of the class status quo, so that occupation, education, qualifications, income, wealth, or net worth, ownership of land, property, and means of production will establish one's class much more so than physical power. manners and cultural refinement: For example, Pierre Bourdieu suggested a notion of high and low classes with a distinction between bourgeois tastes and sensitivities and the working class tastes and sensitivities. the distinction between elaborate language, which is seen as a criterion for "upper-class," and restricted code, which is associated with "lower classes"
This graphic shows a definition of social class proposed by the New York Times, using quintiles as measurement for class. The information was based on U.S. Census data from the 2000 Census as well as the 2003 Economic census survey. 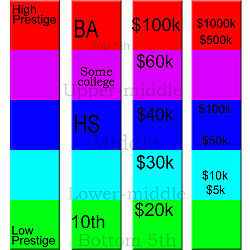 The graphic shows four different attributes which affect social class: professional prestige, educational attainment, income, and wealth. Although class can be discerned in any society, some cultures have published specific guidelines to rank. In some cases, the ideologies presented in these rankings may not concur with the power dialectic of social class as it is understood in modern English use. Today, most talk of social class assumes three general categories: an upper class of powerful owners, a middle class of people who may not exert power over others but do control their own destiny through commerce or land ownership, and a lower class of people who own neither property nor stock in the corporate system, and who rely on wages from above for their livelihood. Especially in the United States, the ideal of a middle class reached via the "American Dream" is of central importance when discussing social class. The Indian Hindu caste system is one of the oldest and most important systems of social class with peculiar rigidity (in the sense it is watertight class, with absence of upward or downward mobility in caste hierarchy). It divided (and still divides) society based on lineage. In its simplest form, the Brahmin class, at the top, was idealized as a leisurely priest class devoted to religious ceremonies, while the Kshatriya defended them as military princes. These groups, roughly equating to the modern idea of an upper class, could be attained by the lower classes through reincarnation or rebirth in a later life so long as the lower class person upheld the dictates given them by the current rulers, the Brahmins. The modern concept of the middle class was represented by the Vaishya caste of artisans, farmers, and merchants, and the lower classes were the Shudra and Ati-shudra laborers. There were also those below these castes known as "outcastes," the Untouchables, who were restricted to occupations deemed low and unclean by the religious establishment. Within this basic framework were arranged a huge number of jatis, or subcastes. Despite being notorious for its rigidity towards individuals, upward and downward mobility is possible, but only for the entire caste itself. That is, it takes a concerted, intentional effort on the part of an entire caste to change the other castes' perceptions towards it and allow upward mobility. In addition, with India becoming more and more industrialized, even the rigid lack of mobility for individuals is being challenged. Traditional Chinese society divided workers based on the perceived usefulness of their work and was somewhat more fluid than the Indian caste system. Scholars ranked the highest because the opportunity to conceive clear ideas in a state of leisure would lead them to wise laws (an idea that has much in common with Plato's ideal of a philosopher king). Under them were the farmers, who produced necessary food, and the artisans who produced useful objects. Merchants ranked at the bottom because they did not actually produce anything, while soldiers were sometimes ranked even lower due to their destructiveness. The Confucian model is notably different from the modern European view of social class, since merchants could attain great wealth without reaching the social status accorded to a poor farmer. In truth, a rich merchant might purchase land to reach farmer status, or even buy a good education for his heirs in the hopes that they would attain scholar status and go into the imperial civil service. The Chinese model was widely disseminated throughout east Asia. However, this traditional model is changing as China integrates into the global free market. 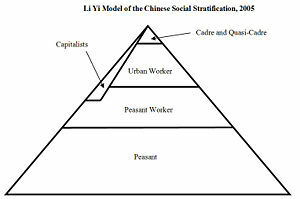 According to Li Yi,  after 1949 in China the social stratification consisted of the peasant class, the working class (urban state worker and urban collective worker, urban non-state worker, and peasant worker), the capitalist class (about 15 million), and a class of cadre (about 40 million) and quasi-cadre (about 25 million). The Japanese class structure, while influenced by the Chinese, was based on a much more feudal environment. The Emperor, as a deity, was unquestionably at the pinnacle of the Japanese class structure (and still is, despite no longer being considered a god). However, for much of Japanese history the emperor was not allowed outside the palace grounds and his will was "interpreted" by a shogun, or military dictator. Beneath the shogun, daimyos, or regional lords, administered the provinces through their samurai lieutenants. Possibly through Chinese influence, and possibly springing from a lack of arable land, the Japanese class structure also ranked farmers above merchants and other bourgeois workers. Like the Chinese model, the Japanese class system has changed to reflect membership in the global markets. an upper class of "nobles and notables"
As in many official class structures, the laborers who made up the majority of the population, but owned no land and relied on wages, were not even considered part of the structure. Iran continues to function as a theocracy, with religious leaders holding much of the power over day to day affairs. For most of France's history, there was an absolute monarchy, with the king at the pinnacle of the class structure. However, the French States-General, established in 1302, provided some sort of legislative assembly with its members ranked according to hereditary class. The "First Estate" consisted of the highborn sons of great families who had devoted themselves to religion (similar to the Indian Brahmins, Confucian scholars, and Qajar theology students). The "Second Estate" were the highborn sons who were devoted to war (compare to the Indian Ksatriyas and Japanese daimyos, but contrast with the low status given to soldiers in China). The "Third Estate" consisted technically of everyone else, but was represented only by the richest members of the bourgeoisie. In truth, the peasantry had no voice at all in the system, as contrasted with the ideologically high status of farmers in Confucian China. The rigidity of the French hereditary system was a major cause of the French Revolution. Since then, the French have attempted to adhere to a socialist system in which class disparities should never grow too large. The Parliament of the United Kingdom still contains a vestige of the European class structure undone in France by the French Revolution. The Queen maintains her status at the top of the social class structure, with the House of Lords, up until very recently, representing the hereditary upper class and the House of Commons technically representing everyone else. As with the French States-General, the House of Commons historically spoke just for the gentry and very rich bourgeoisie. In the Victorian era of the United Kingdom, social class became a national obsession, with nouveau riche industrialists in the House of Commons trying to attain the status of House of Lords landowners through attempts to dress, eat, and talk in an upper class manner, marriages arranged to achieve titles, and the purchase of grand country houses built to emulate the old aristocracy's feudal castles. It was the Victorian middle class who tried to distance themselves from the lower class with terms such as "working class," which seemed to imply that their new "white collar" positions should not be considered "work" since they were so clean, modern, and safe. It was also in nineteenth century Britain that the term "Fourth Estate" was used to describe the press. Thomas Carlyle equated the Queen to France's First Estate of clergy, the House of Lords to France's Second Estate of hereditary aristocracy, and the House of Commons to France's Third Estate of rich bourgeoisie. But he then pointed out that the editors of newspapers in Britain's booming Industrial Revolution (similar to the pamphleteers before and during the French Revolution) held powerful sway over public opinion, making them equally important players in the political arena. The political role of the media has become ever more important as technology has blossomed in the twentieth and twenty-first centuries, but few academic models today set aside the media as a specific class. Schools of sociology differ in how they conceptualize class. A distinction can be drawn between "analytical" concepts of social class, such as the Marxian and Weberian traditions, and the more "empirical" traditions such as a socio-economic status approach, which notes the correlation of income, education, and wealth with social outcomes without necessarily implying a particular theory of social structure. The Warnerian approach can be considered "empirical" in the sense that it is more descriptive than analytical. It was in Victorian Britain that Karl Marx became the first person to critically attack the privileges not just of an hereditary upper class, but of anyone whose labor output could not begin to cover their consumption of luxury. The majority proletariat which had previously been relegated to an unimportant compartment at the bottom of most hierarchies, or ignored completely, became Marx's focal point. He recognized the traditional European ruling class ("We rule you"), supported by the religious ("We fool you") and military ("We shoot at you") élites, but the French Revolution had already shown that these classes could be removed. Marx looked forward to a time when the new capitalist upper class could also be removed and everyone could work as they were able, and receive as they needed. Karl Marx defined class in terms of the extent to which an individual or social group has control over the means of production. In Marxist terms, a class is a group of people defined by their relationship to their means of production. Classes are seen to have their origin in the division of the social product into a "necessary product" and a "surplus product." Marxists explain the history of "civilized" societies in terms of a war of classes between those who control production and those who actually produce the goods or services in society (and also developments in technology and the like). In the Marxist view of capitalism, this is a conflict between capitalists (bourgeoisie) and wage-workers (the proletariat). For Marxists, class antagonism is rooted in the situation that control over social production necessarily entails control over the class which produces goods—in capitalism this amounts to the exploitation of workers by the bourgeosie. Marx himself argued that it was the goal of the proletariat itself to displace the capitalist system with socialism, changing the social relationships underpinning the class system and then developing into a future communist society in which: "the free development of each is the condition for the free development of all" (Communist Manifesto). Vladimir Lenin defined classes as "large groups of people differing from each other by the place they occupy in a historically determined system of social production, by their relation (in most cases fixed and formulated in law) to the means of production, by their role in the social organization of labor, and, consequently, by the dimensions of the share of social wealth of which they dispose and the mode of acquiring it." The seminal sociological interpretation of class was advanced by Max Weber. Weber formulated a three-component theory of stratification, with class, status, and party (or politics) as subordinate to the ownership of the means of production; but for Weber, how they interact is a contingent question and one that varies from society to society. One can have strength in one, two, all three, or none of these categories. For example, a drug dealer may be wealthy and therefore of the upper class, but is not respected in society and therefore of low status. A priest may not have any money but is held in high esteem in society. A Chief Executive Officer (CEO) of a corporation is likely wealthy and respected, but may not have any political power. An early example of a stratum class model was developed by the sociologist William Lloyd Warner in his 1949 book, Social Class in America. For many decades, the Warnerian theory was dominant in U.S. sociology. Upper-upper class. "Old money." People who have been born into and raised with wealth; mostly consists of old, noble, or prestigious families (e.g., Vanderbilt, Rockefeller, Hilton). Lower-upper class. "New money." Individuals who have become rich within their own lifetimes (entrepreneurs, movie stars, as well as some prominent professionals). Upper-middle class. High-salaried professionals (doctors, lawyers, higher rung (were in the corporate market, yet left for a reason such as family time) professors, corporate executives). Lower-middle class. Lower-paid professionals, but not manual laborers (police officers, non-management office workers, small business owners). Upper-lower class. Blue-collar workers and manual laborers. Also known as the "working class." Lower-lower class. The homeless and permanently unemployed, as well as the "working poor." To Warner, American social class was based more on attitudes than on the actual amount of money an individual made. For example, the richest people in America would belong to the "lower-upper class" since many of them created their own fortunes; one can only be born into the highest class. Nonetheless, members of the wealthy upper-upper class tend to be more powerful, as a simple survey of U.S. presidents demonstrates (the Roosevelts, Kennedys, Bushes). Another observation: Members of the upper-lower class might make more money than members of the lower-middle class (a well-salaried factory worker vs. a secretarial worker), but the class difference is based on the type of work they perform. In his research findings, Warner observed that American social class was largely based on these shared attitudes. For example, he noted that the lower-middle class tended to be the most conservative group of all, since very little separated them from the working class. The upper-middle class, while a relatively small section of the population, usually "set the standard" for proper American behavior, as reflected in the mass media. Professionals with salaries and educational attainment higher than those found in the middle of the income strata (bottom rung professors, managerial office workers, architects) may also be considered as being true middle class. Fussell no longer recognized a true lower middle class, its members either having advanced into the middle class due to rising requirements of formal education or becoming indistinguishable from the "high proles" or even the "mid proles." 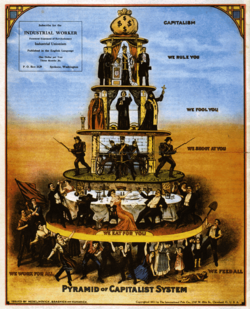 the capitalist class (a term borrowed from Marx) made up of the executives of large corporations, large-scale investors in the stock market, and the heirs of extremely successful entrepreneurs with an annual income of about US$2 million on average. They make up about one percent of the population. the upper middle class, actually sitting well above the middle of the model, is made up of doctors, high ranking managers at large corporations, lawyers, the owners of medium-sized commercial interests, and very successful accountants. Their average income is $120,000 a year, and they comprise 14 percent of the population. the middle class, actually sitting just above the middle of the model, made up of foremen, lower level managers at large companies, the sellers of bulk industrial and technological goods, and very successful craftsmen. The average income is $55,000 and the class makes up 30 percent of the population. the working class, a phrase borrowed from Victorian distinctions between managerial and active work. This group comprises clerical workers, retail salespeople, and well-paid manual laborers. The average income is $35,000 a year, and the class makes up 30 percent of the population. the working poor, a group of poorly paid manual and service workers making up 13 percent of the population and averaging $22,000 a year. an underclass of people working only part time in service jobs, or not working at all and relying on government support for sustenance. The average income is $12,000 a year, and the class makes up 12 percent of the population. Some would argue that any conception of class based on power models is too narrow, since so much of quality of life cannot be expressed in terms of dollars or acres owned. A retired teacher on a small, but adequate stipend may actually enjoy a great deal more freedom, health, and social respect than an overworked executive making a six figure income at a discredited corporation. In addition, many people can be difficult to fit into the above models. There is the question, for instance, of whether the wife of an upper class man is automatically upper class herself, even if her education, manners, and her own net worth would place her in a lower class status. Additionally, children, who usually enjoy the comfort and prestige related to their parent's social class, may actually live very poorly with abusive high class parents or at a very high level of consumption and income if their low class parents spoil them. Some youth rights activists would argue that all minors are lower class due to their lack of choice in where they live, how they spend their time, and who makes the laws affecting them. Similar arguments could be made concerning women in many parts of the world. These issues point out that the nature of class itself might be flawed and inappropriately applied to society. Some could argue that class breeds needless feelings of competition and feelings of inequity; such arguments typically come from Marxist schools of thought. Those in favor of systems of class, such as capitalists, would argue that eliminating the possibility of class eliminates the incentive for progress in society. It is necessary to strike some balance of equality while maintaining incentives to progress. ↑ Li Yi, Structure and Evolution of Chinese Social Stratification (University Press of America, 2005, ISBN 0761833315). ↑ Encylopaedia Iranica, The Qajar Class Structure. Retrieved December 2, 2006. ↑ Fact Check.org, Update on Kerry's "Shrinking Middle Class"—Still Shrinking in 2003. Retrieved December 2, 2006. ↑ Marxists Internet Archive, A Great Beginning. Retrieved December 2, 2006. Blau, Peter and Otis D. Duncan. The American Occupational Structure. 1967. Raico, Ralph. "Classical Liberal Exploitation Theory" Journal of Libertarian Studies. 1(3) (1977): 179-183. Retrieved March 24, 2007. Sorokin, Pitrim. Social Mobility. New York, NY: Harper, 1927. Weber, Max. "Class, Status and Party" in From Max Weber: Essays in Sociology. Oxford University Press, 1958. Weinburg, Mark. "The Social Analysis of Three Early 19th century French liberals: Say, Comte, and Dunoyer" in Journal of Libertarian Studies. 2(1) (1978): 45-63. Retrieved March 24, 2007. This page was last modified on 7 October 2015, at 23:29.